Police investigating a murder had legal power to video record a child during searches at her home, a High Court judge has ruled. Mrs Justice Keegan rejected claims that images of the nine-year-old girl were unlawfully captured in an operation linked to the killing of taxi driver Michael McGibbon. Mr McGibbon, 33, died after being shot three times in the legs at Ardoyne in north Belfast in April 2016. Police hunting for the suspected dissident republican murderers carried out a search at the girl’s home four months later. The child’s mother and her partner were arrested but later released unconditionally. During the operation an evidence-gathering team video-taped members of the family, including incidental footage of the child. 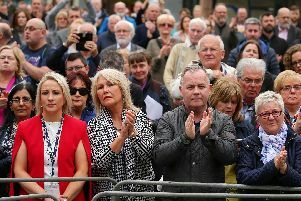 Her mother issued proceedings against the PSNI, claiming the policy or practice of using the recording methods and retaining film obtained from searches of a home breached privacy rights. She stated her children had suffered distress by strangers entering their house in the morning and video-taping them as they got out of bed. Her solicitor, Michael Brentnall, said some of the footage he viewed showed the girl in her mother’s arms. A police search advisor provided evidence that the background to the search was a fatal gun attack involving a claim of a responsibility by the ‘New IRA’. “The male (Mr McGibbon) had the previous night, been threatened at his home by unidentified makes who claimed to be the ‘RA,” he added. The court heard the search was authorised by a detective inspector, with the evidence-gathering team’s intention to provide impartial, non-edited evidence and avoid any malicious complaints. The operation was staged at a reasonable time and without rapid entry, according to police. Any images captured were to be held securely in accordance with PSNI guidance. Mrs Justice Keegan said the issue was whether the police actions amounted to an abuse of power at a private home. She pointed out that it had been a lawful search, properly authorised under legislation for probing terrorist offences. “The search was to look for weapons and recording equipment, the backdrop being an investigation into a murder,” the judge noted. She also acknowledged that the recording was overt, with none of the footage retained by police have been broadcast. “The capture of the images of the child was incidental,” Mrs Justice Keegan said.